In a recent PAX Cable Television Network Special that featured Christopher Dunn, the narrator stated that the origin of the word "pyramid" was unknown. Both academic Egyptologists and I would agree this statement is incorrect, but I would strongly disagree with most Egyptologists on the true origin of the word. The word pyramid is derived from the Greek words PYRAMIS and PYRAMIDOS. The meaning of the word Pryamis is obscure and may relate to the shape of a pyramid. The word Pyramidos has been translated as "Fire In The Middle". This meaning is very interesting and I will return to it later. Well known American Egyptologist Mark Lehner has stated that the ancient Khemitian term for pyramid was something he calls MR.Pyramid. Lehner bases this on his translation of MR as "Place of Ascension" following his belief that pyramids were tombs for kings and where the dead king’s souls "ascended". But MR, usually written as Mer, is commonly translated as beloved, as in Meriamen (Beloved of Amen, The Hidden) or Meritaten (Beloved of Aten, The Wiser). Our indigenous sources tell us Mer meant "beloved" and had nothing to do with pyramid. My Indigenous Wisdom Keeper teacher, Abd’El Hakim Awyan, states unequivocally that the ancient Khemitians used the term PR.NTR, Per-Neter, for pyramid. Per means "house" and Neter we have discussed in the previous article. Neter has been translated by Egyptologists as "God" or "Goddess" but we reject this mistranslation. In alignment with the indigenous tradition, we use the interpretation "House of Nature, House of Energy" for Per-Neter. The temple was Per-Ba (House of the Soul) and the tomb was Per-Ka (House of the Physical Projection) according to the indigenous tradition. With this understanding of Per-Neter as House of Nature, I state categorically that no one was ever intended to be buried in a pyramid in its original intent! Even Mark Lehner has admitted that no evidence of an original burial in any of the major Khemitian pyramids has ever been found. Also no inscriptions or reliefs either depicting or stating that any king was ever buried in a pyramid have ever been found. One of the main purposes of the Great Per-Neter was to generate, transform, and transmit energy. The Indigenous Wisdom Keepers of Egypt have provided us a concrete paradigm to support the power plant theory of Christopher Dunn. Although Egyptologists base their pyramid-as-tomb theories on the writings of Greek historians such as Herodotus, the Greek word Pyramidos is closer to the true meaning. Indeed, if we support Dunn’s ideas that the energy reactions in the Great Pyramid took place in the so-called Queen’s and King’s Chambers, then certainly it was Fire In The Middle. Glyph of Per-Neter, House of Nature, Energy. 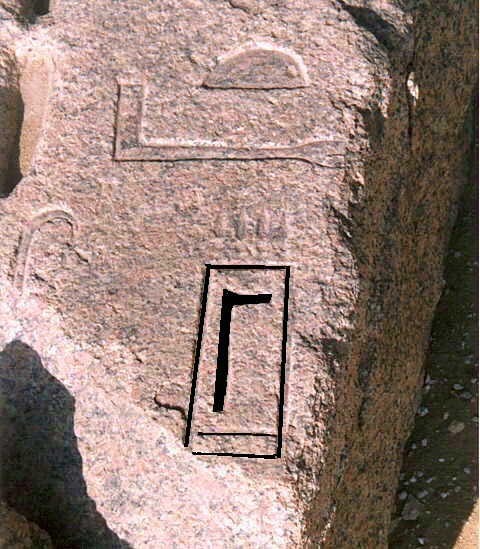 Taken by author at Abusir,1997.